Updated Monday 8.53pm with Corinthia explanation below - The Corinthia Group defended its plans for the St George Bay development on Monday and denied some claims being made about it. The group issued a statement in the wake of media reports and statements by environment NGOs. Earlier, Moviment Graffitti hit out at a proposed deal between the government and the group, which it said would mean giving away public land “for a pittance”. Describing the proposed deal as “intrinsically wrong on every level”, the group said in a statement on Monday that the land would be used “for a monstrous project that will have a disastrous impact on people and the environment”. According to a still unpublished draft deed, the Corinthia Group has been awarded the whole of the St George’s Bay peninsula for at least 99 years at a fraction of current market prices, as well as the seabed for land reclamation. Corinthia will pay a premium of €17 million for the land, a figure which has drawn criticism from industry figures, and plan to build 100,000 square metres of commercial and residential real estate and offices. The NGO also referred to reports that the project would include 12 towers with more than 500 apartments, three times the amount of the recently-approved City Centre project on the nearby Institute of Tourism Studies site. Moviment Graffitti noted that the local plan would have to be amended to allow the development to be approved, and that a master plan for the broader area was still nowhere to be seen despite repeated promises. It accused the authorities of implementing a “secret masterplan”, circumventing normal channels, in light of the several massive projects in the area. “This is a masterplan that fully transforms that area in a gold-mine for the very wealthy, and completely ignores quality of life considerations and environmental protection,” the NGO said. In a separate statement, NGO Flimkien għal Ambjent Aħjar maintained that the transfer of yet another vast area of prime real estate in the area, to a private enterprise raised many social, environmental and economic concerns. "In the first place the area was conceded to the group specifically for tourism purpose, supposedly to improve the tourism product, create long-term employment, and benefit the public good," the group said. In its reaction, the Corinthia said it already holds long-term exclusive rights to the land. "The draft agreement with Government covers solely contractual terms for the restatement of our existing ownership rights to the land in St George’s Bay, nothing more. The draft limits us to potentially developing a maximum of 100,000m2 of commercial and residential areas, besides an obligation to develop two new luxury hotels. This limitation should be also be read in relation to the floor areas we are currently allowed to develop under current planning rules." the group said. "The contract therefore, is about terms and conditions stipulating maximum limitations and not about architectural plans, of which there are none in our proposed agreement with government, as these will be developed over the years to come in a series of phases and subject always to planning rules and consent." The group insisted that certain visuals presenting several high-rise buildings crammed next to one another on the St George’s peninsula were misleading. "They certainly do not represent our plans, or our track record in developing landmark, balanced projects in Malta and overseas. They cannot therefore serve as a reference for an informed debate. With regard to claims on the number of serviced residences which will be developed on this site, the company said that subject to the draft agreement, actual architectural plans have been prepared for the proposed phase one (picture), and these will be discussed with the relevant regulatory and planning authorities in due course. "Our aim here, in this first phase, is to entirely redevelop the Corinthia Hotel into Malta’s foremost luxury property together with extensive landscaped gardens and amenities. In parallel, we are aiming to develop two luxury serviced residential blocks, the highest proposed to be 15 floors, on land located between the current Corinthia and Radisson hotels. In total, these blocks will accommodate 90 apartments that have been designed to a standard that would make them competitive internationally and therefore make Corinthia the forerunner in this sector in Malta. "What will happen beyond will depend on many factors, including economic viability, planning considerations, and so much more, but above all, a commitment of ensuring a beautiful development of six-star standard supporting our new Corinthia hotel. With regard to claims that the company intends to develop 12 towers, the highest of which will be 21 floors, the company said the master plan being presented on some local newspapers was an outdated volume study, one of many which was prepared in the past years, in order to analyze the different possibilities. 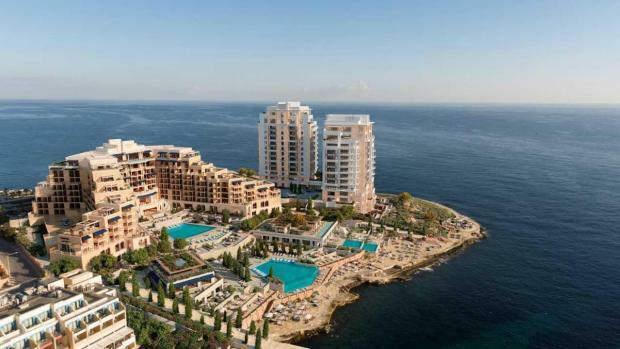 "Currently the company only has plans to redevelop the Corinthia Hotel into Malta’s foremost luxury property and develop two luxury serviced residential blocks. Our intentions remain for the vast majority of our land will remain open and landscaped, indeed the majority of the land will remain unbuilt as this is cardinal to achieve our six-star standard. In itself, this clearly demonstrates our intentions to maintain a balanced, holistic environment to our proposed luxury hotels and serviced residences. The group also insisted it has no intention of pursuing land reclamation. "We understand the proposed clause in our draft agreement is standard to similar agreements across Malta. However, we repeat, that we do not intend to pursue any land reclamation as part of our project and consequently this concern is a non-starter," it said.